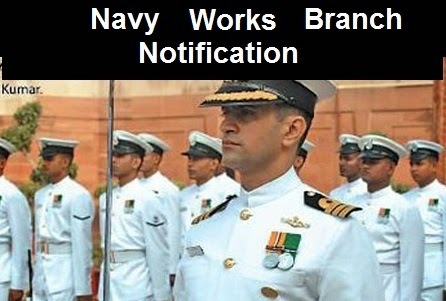 Want to join Indian Navy as works branch officer and looking for notification? Check out Indian Navy Works branch December 2013 course notification, eligibility criteria, last date to apply and procedure to apply online. Indian Navy has released notification of works branch officer posts. Permanent commissioned officer career in Indian Navy is one of the best careers for Indians as it provides good amount of challenging life. Applicant wishing to apply for works branch commissioning in Indian Navy should fulfill the following criteria. Applicant should be a male. Applicant of works branch should have been born between 02nd January 1989 and 01st July 1994. Applicant must have scored minimum 60 % in any one of the following graduation degrees. Applicant should be mentally and physically healthy. Online applications will be available on Indian Navy's official website from 08th May 2013 onward. Applicants need to fill up online application and after that they need to send the print outs to the Navy's recruitment board. Last date to apply for Indian Navy's Works branch December 2013 course is 31st May 2013. Logistics officers will be selected by SSB interviews conducted by Services Selection Boards located in Bangalore, Bhopal and Coimbatore. Also check out Navy Logistics branch notification.